An analysis of Americans’ time spent with the major digital platforms supports continued advertising investments in Google’s properties (including YouTube, Waze, etc. ), but may question the longer-term wisdom of the rapid expansion in Facebook’s demand pool. 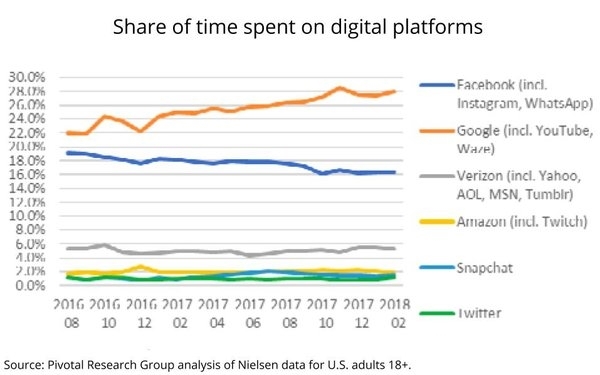 The analysis of Nielsen data on digital content consumption shows that overall usage for all platforms is up 13% this year, but not all platforms are performing equally, according to the analysis of Nielsen data by Pivotal Research Group. Google’s properties have soared to nearly 28% of the share of time Americans spend with digital platforms. “Meanwhile, Facebook appears to be going the other direction,” writes Pivotal’s Brian Wieser, adding: “Core Facebook lost -5% in aggregated time spent despite a +5% increase in users, reflecting a -10% decline per person. Instagram, which only represents around 12% of the usage of the core Facebook property, performed much better with a gain of +31% more time on +25% more users for a +5% increase in time per user.